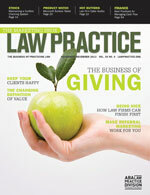 In the November/December 2013 issue of the ABA’s Law Practice magazine, my marketing column talks about a favorite topic of many law firms (sarcasm) – branding! My constant yipping, yapping and yammering at the conference room table to law firm partners about branding is often met by head nods, eye rolls and that innate sense they believe my briefcase contains a liter bottle of snake oil. Truth be told, there is really no such thing as marketing without branding. Because what we are doing with all that time, money and energy is developing, enhancing, refreshing or creating a brand or brands. Together with determining market position and looking to increase market share, the brand truly is the heart of the marketing message. This article should provide attorneys with a quick primer on what goes into branding–and why you need to care about it. There is a reason corporations spend huge sums of money protecting their brand–because that is what the public is buying. And damage to a brand or a weak brand identity will eventually lead to your demise. Many attorneys and some law firm marketers still seem to think that a brand is a logo–determining colors and what type of coffee mug to put it on. When was the last time your firm refreshed its brand? Or conducted a branding & positioning audit? If you don’t know the answer, it has been too long. You’ve likely added an office here, a new practice area there, an attorney or two along the way. All of those components can shift your focus. If this is a topic of interest, you can learn more about Brand Development & Strategy here.